When I was a junior at a small liberal arts school which shall remain nameless, I had two life-changing conversations. To be honest, they weren’t so much conversations as shutdowns — brief and dismissive encounters, like when a bully slaps the lunch tray out of your hands — the sort of “conversation” that leaves you with little comeback and covered in ketchup. But they mobilized me. I was pursuing a degree in English and biology at the time, and I naively thought the disciplines spoke to one another. You know, because we’re all just looking for answers. Dorit Cyprus, On the Nature of Experience. C-print, 1990. Courtesy of the Walker Art Center. This? I thought. My heart sank. This… meaning life? 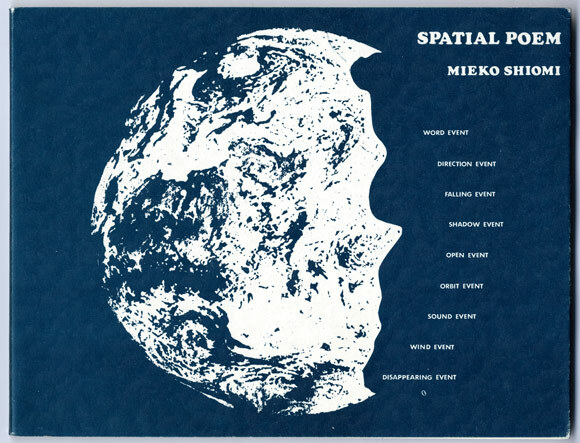 Mieko Shiomi, Spatial Poem (No. 4). Off-set lithography on paper, 1976. Courtesy of the Walker Art Center. Shift your view, if you would, to a biology classroom elsewhere on that campus, another day, not long after. I had presented — well, I thought — on the subject of sperm whales. I’d even managed to slip in a joke or two. I mean: sperm whale, c’mon. They call them that for a reason, and it’s not an unfunny one. 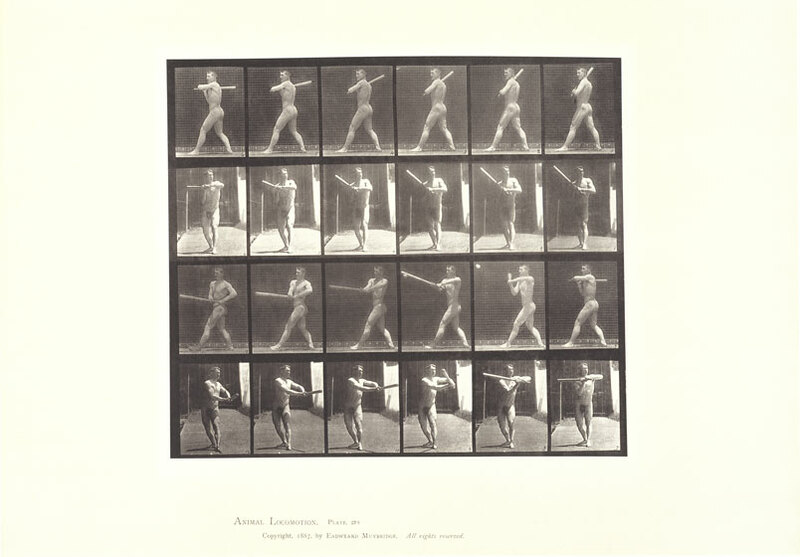 Eadward Muybridge, Baseball, Batting Plate #274 from Human and Animal Locomotion. Collotype on paper, 1887. Courtesy of the Walker Art Center. I’m not one to haggle over grades — really, truly — but when our presentation scores came back, I was surprised to find a little minus sprouted from the A like a skin tag. I asked why. I couldn’t help it. My professor, who shall remain nameless, shifted and cleared his throat. “Humor really has no place in a scientific presentation,” he said. And this time, instead of sinking, my heart ignited with defiance. No place? (What?) Why not? After days of watching classmates dryly point at population diagrams, it had never occurred to me that lightening the load for my audience for the sake of better communication of information might be frowned upon. Ranjani Shettar, Invitations (detail). Cloth, resin, synthetic cotton, 2000. Courtesy of the Walker Art Center. If minds accept the ways and teachings of art just as readily as they accept those of science, and vice-versa, new things can happen: it’s always valuable to include more points of observation in any field of view. Indeed. It’s just that spirit of what if which illuminates the commonalities between art and science. To put it all in an overly simple equation: science=knowledge=understanding=communication=art. Bringing art and science into conversation together fecundates each, and a bounty of knowledge results. I’m going to try and do just that, right here, from time to time. What about you? Game to join me? Are you willing to let your peas and carrots mix? 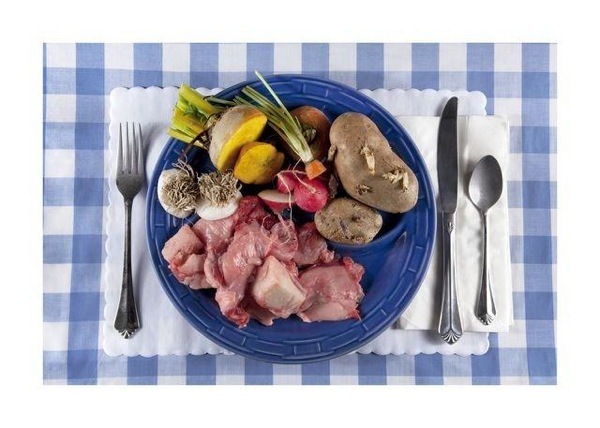 John Waters, Blue Plate Special. 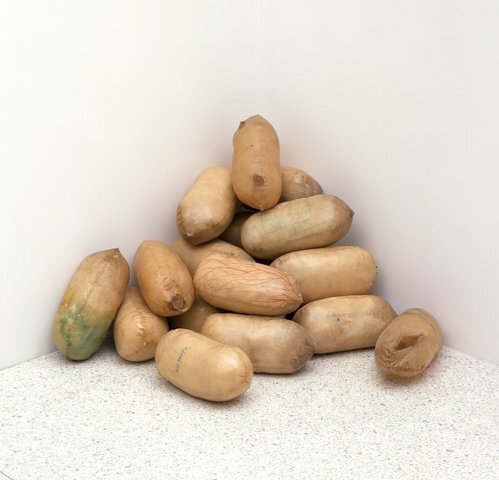 Color chromogenic print, 2011. Courtesy of the Walker Art Center. Maggie Ryan Sandford is a science journalist, fiction writer, performer, and media producer who has devoted her life to promoting widespread scientific literacy. Her work has been published in Slate, Smithsonian, mental_floss, the Onion A.V. Club, Paper Darts, Revolver, Thirty Two, the Indiana Review online, McSweeney’s Book of Politics and Musicals, and she has appeared at the Walker Art Center, the Seattle Art Museum, the Minnesota Institute of Arts, the Guthrie Theater, the Upright Citizen’s Brigade Theatre NYC, and on National Public Radio and Twin Cities Public Television. She was named champion of both Literary Death Match 100 and Revolver magazine’s recent “Write Fight,” and is part of the bimonthly storytelling group Rock Star Storytellers. More at MaggieRyanSandford.com.